If you are facing a new heating and air conditioning installation you may be wondering if a packaged HVAC system is right for your home. Many home and business owners are discovering that packaged systems offer benefits they had not previously considered. Any time you can have one system do the job instead of two, you are talking about savings and convenience. With a packaged HVAC system, there’s no need to install two different units. You can get a heater and air conditioning all in one neat cabinet. Less fuss, less maintenance. These systems are specially designed to fit in smaller spaces. You won&’t need to clear away two different spots for both a furnace and an air conditioning unit, because it will all be in one compact package. 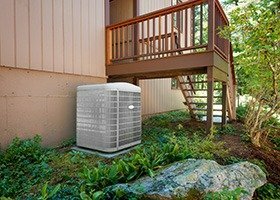 If you are building a new home or remodeling, finding the space for everything can be an issue, but packaged HVACs make the climate control easier to incorporate. At Wilson’s, our packaged HVAC systems are much more energy efficient than traditional models. This enables you to save money while reducing the wear and tear on your system. Energy-efficiency is more than just a trend — it’s a smart way to handle climate control.